Marks: Faint traces of acid etched 3 line signature. 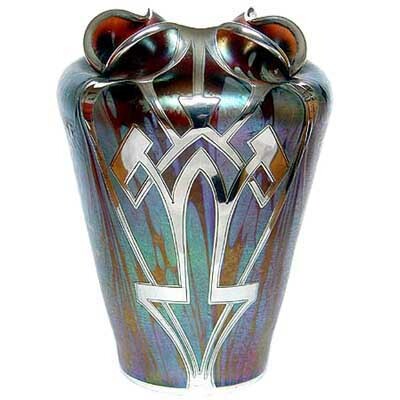 Arts & Crafts Tudric pewter vase with Clutha glass liner made for Liberty & Co, England c1902. 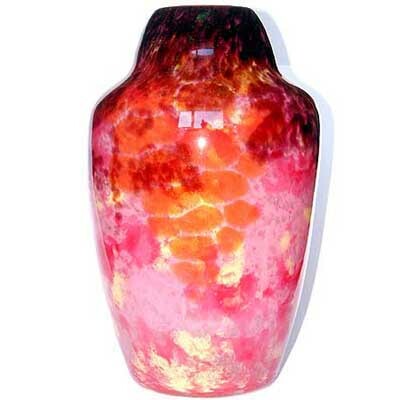 Large scrambled millefiori glass vase attributed to AVEM (Arte Vetraria Muranese), Murano, Italy c1955. 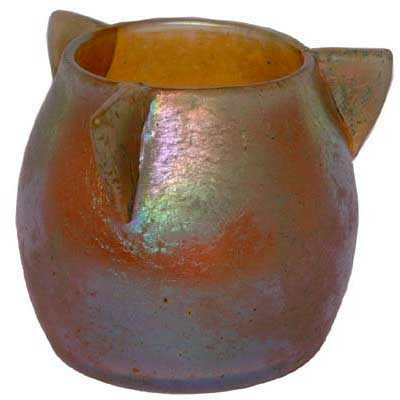 Art Nouveau iridescent Favrile glass bowl by Louis Comfort Tiffany, USA c1900. Unusual Monart bowl with polychrome surface decoration, shape code DB, England c1930. 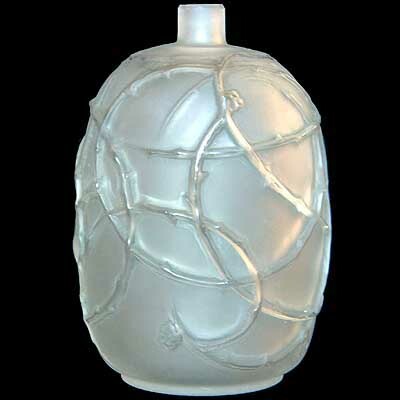 Clear glass vase with applications designed by Ercole Barovier for Ferro Barovier Toso, Italy 1938. 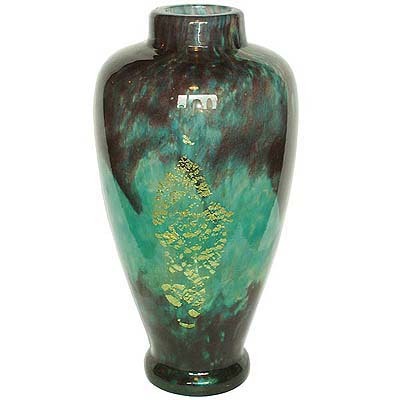 Description: Fine internally decorated Clutha glass vase with gold mica inclusions by James Couper & Son the design attributed to Christopher Dresser, England circa 1885. 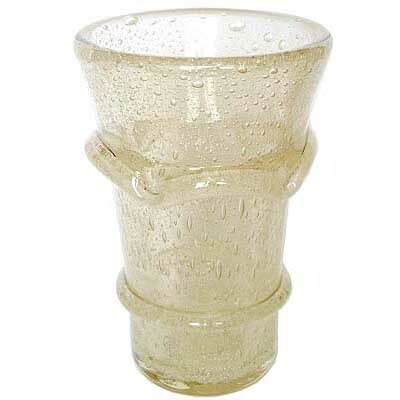 Large part set of “Meteor” pattern glasses designed by Koloman Moser for Bakalowitz and made by Meyr’s Neffe c1900. 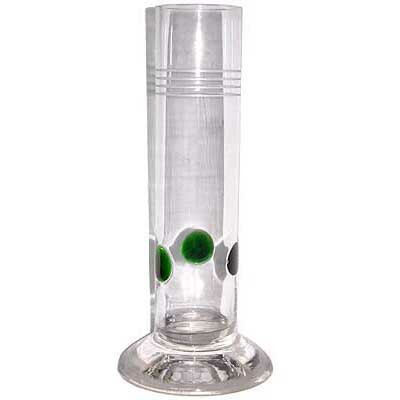 The set consists of 9 larger wine glasses, 8 smaller wine glasses and 3 champagne coupes. 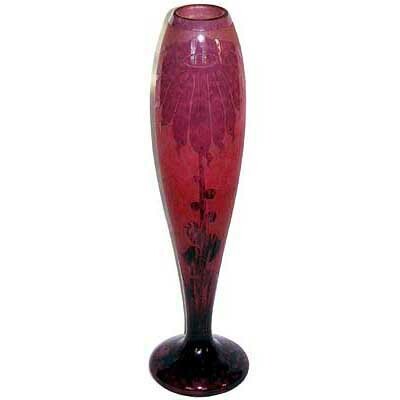 Art Nouveau Loetz glass with pink iridescent body and applied gold iridescent handles, Austria c1910. 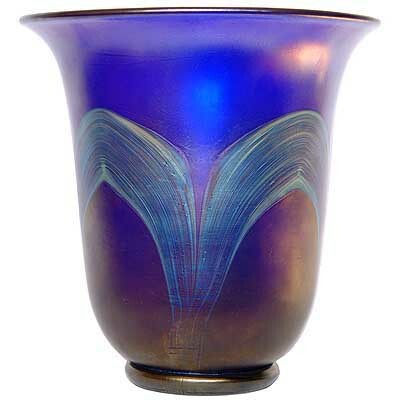 Arts & Crafts Tudric pewter and Clutha glass vase designed by Archibald Knox for Liberty & Co, England c1902. 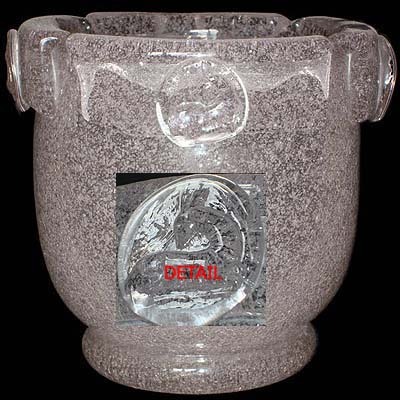 This model is exceedingly rare with a Clutha glass liner. 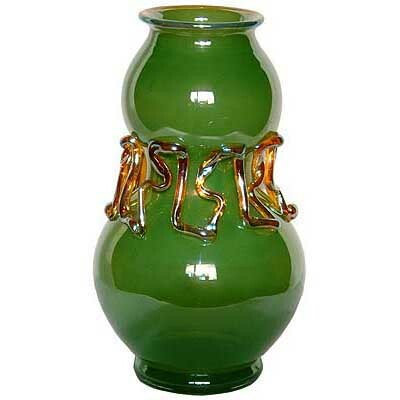 Art Nouveau glass ewer and 6 glasses designed by Richard Teschner for Loetz, Austria c1906. Collection of 5 Venini Clessidre incalmo hour glasses designed Paolo Venini c1955. 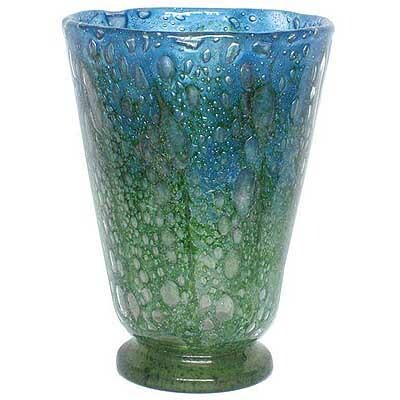 Unique cameo glass vase with acid textured surface and gilding designed by Edvin Ollers for Kosta, Sweden 1917. 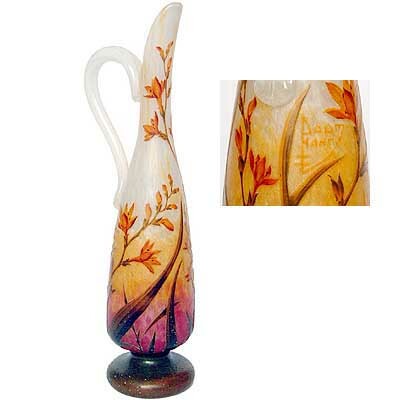 Leerdam citron yellow glass vase with internal “tin crackle” decoration. Designed by Andries Dirk Copier c1930’s. 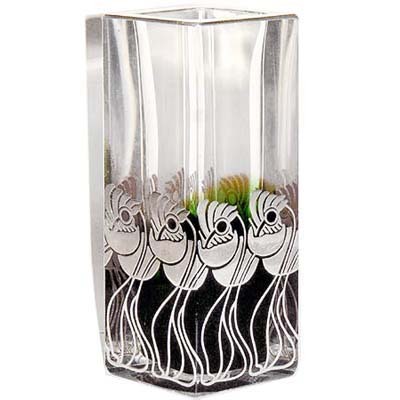 Pair of glass and brass wall lights modelled as stylised feathers designed by Tyra Lundgren in 1940 for Venini, Murano, Italy. 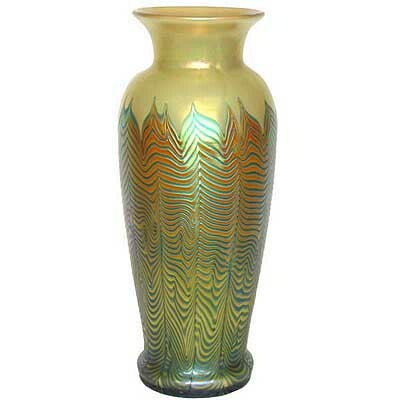 Large and impressive heavy walled bubble glass vase by Schneider, France c1925. 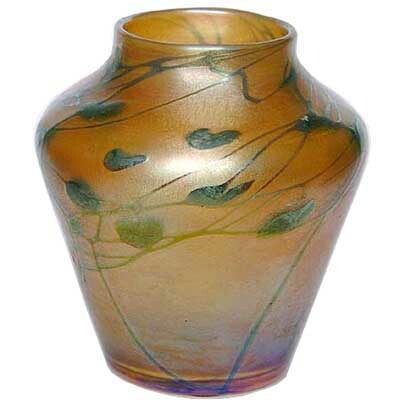 Rare Arts & Crafts internally decorated glass vase by James Powell, England c1900. 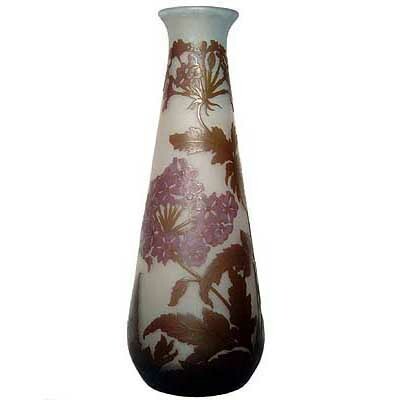 Tall vaseline glass floriform floor vase, Possibly by Walsh Walsh c1900. 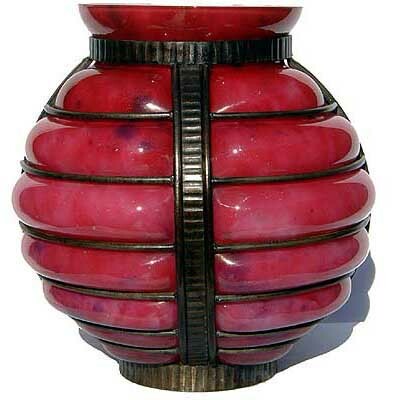 Venini incalmo carafe in raspberry and aquamarine glass, Murano, Italy c1955. 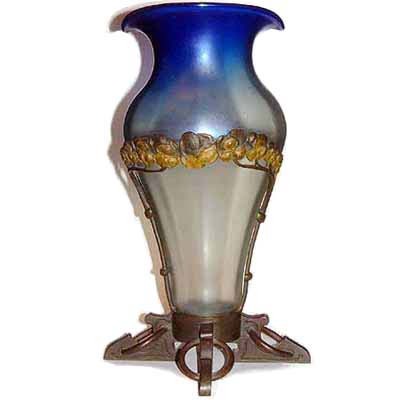 Art Nouveau floriform vaseline glass centrepiece with brass mount by James Powell, England c1900. Loetz Ausfuhrung 134 decor internally decorated Loetz glass bowl and cover with applied feet and finial, Austria c1915. 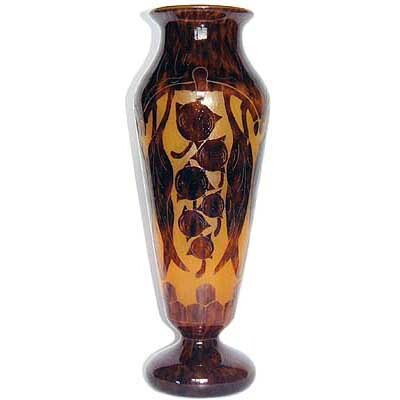 Impressive Art Nouveau Orivit gilded pewter and Val St Lambert cameo glass vase, Germany and Belgium c.1900. 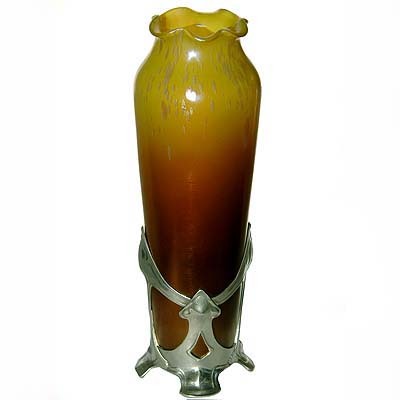 Art Nouveau pewter and glass vase by J Reinemann of Munich, Germany c1900. 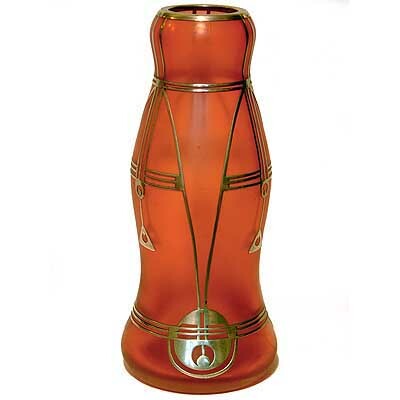 Art Deco opalescent glass vase decorated with dancing water sprites, France c1930. 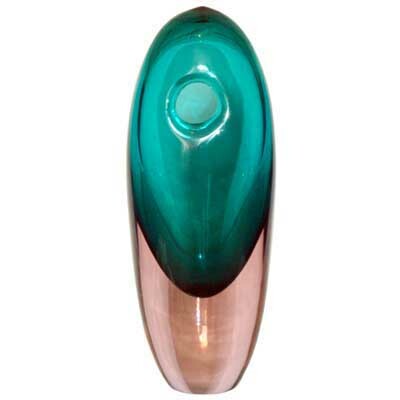 Large Venini incalmo Clessidre hour glass in raspberry and aquamarine glass, Murano c1955. 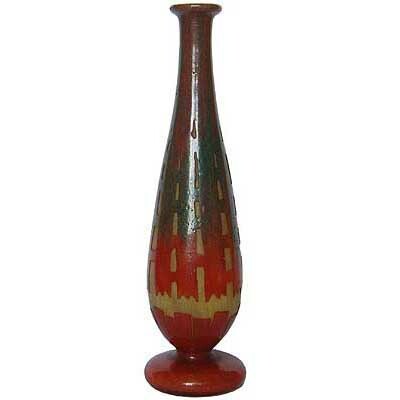 Art Deco enamel and acid treated vase by Daum, France c1920. 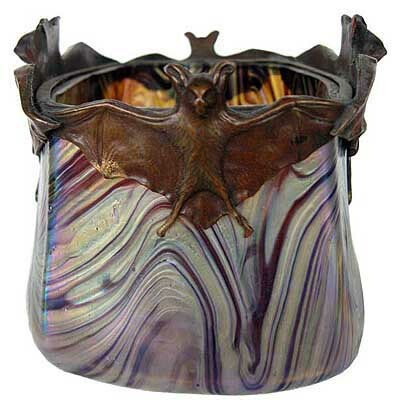 Art Nouveau iridescent glass bowl with four applied handles attributed to Loetz, Austria c1920. 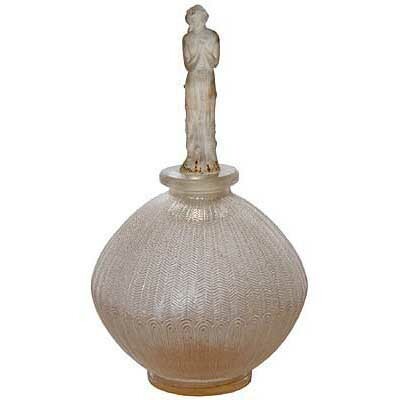 Very rare model of Liberty & Co Tudric pewter and Powell glass decanter by Archibald Knox for Liberty & Co, England c1902. 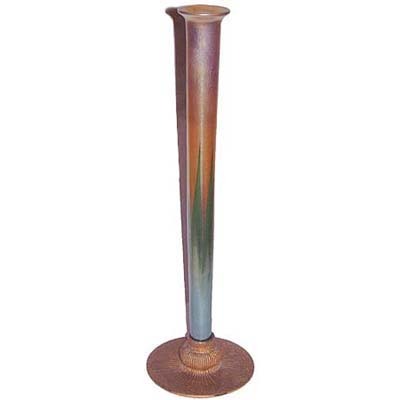 Note: In over 25 years of specialising in Liberty & Co metal work I have not seen this model before. 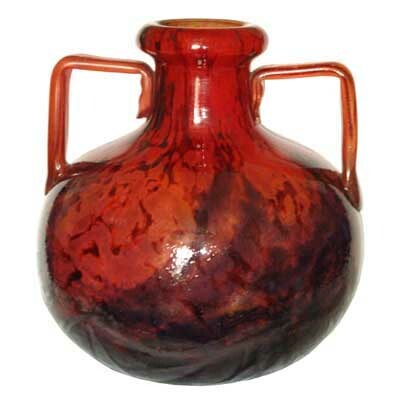 Loetz glass vase in Tango orange with applied black stripes and rim after Michael Powolny, Austria c1915. 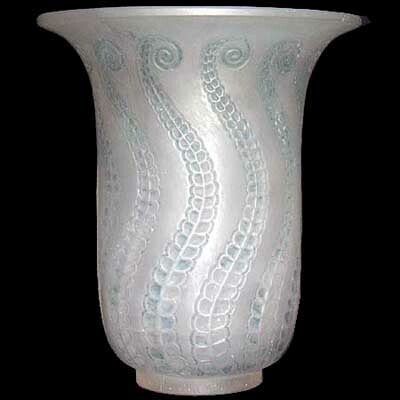 A rare, unusual and large Art Nouveau pewter mounted applied pad cameo glass vase attributed to Loetz, Austria c1910. 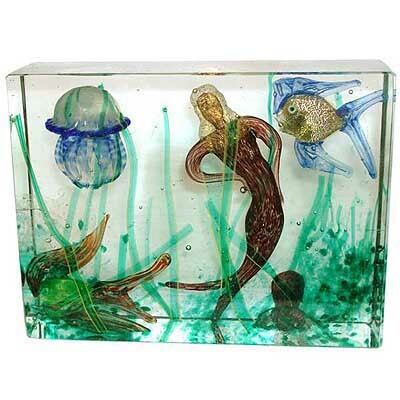 Rare iridescent hot worked glass animal in “iridato” glass by Flavio Poli for Seguso Vetri D’Arte, Italy c1940. 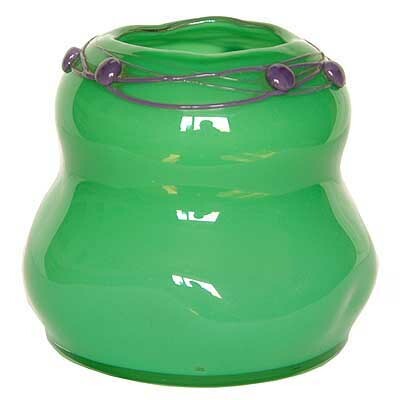 “Summer” – Internally decorated heavy walled glass vase by Vicke Lindstrand for Kosta, Sweden c1950’s. From the Seasons Unica series designed by Vicke Lindstrand. 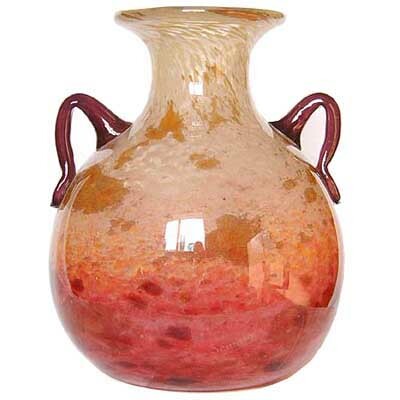 Heavy walled Somerso glass vase attributed to Flavio Poli for Seguso Vetri D’Arte, Italy c1950.